Reap the benefits of a downtown location, newly renovated accommodations and luxury amenities at The Lodge at Sonoma Renaissance Resort & Spa. 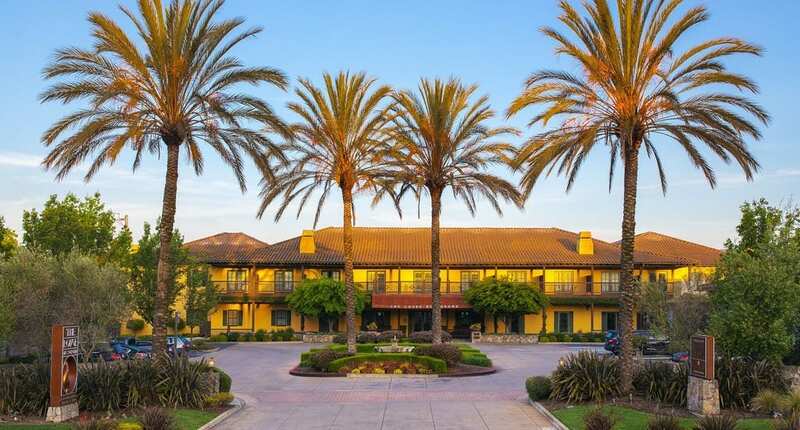 Situated in the heart of California wine country, guests are treated to easy access to the area’s stunning beauty. Every room has been renovated in a rustic-chic style with plush bedding, mini-refrigerators and flat-panel televisions. Rooms and suites also benefit from having outdoor space with stunning Sonoma views. Many rooms also sport fireplaces, perfect for a cozy night. Guests of the resort are invited to attend Yoga classes in our modern gym, take the plunge in our outdoor, heated pool or indulge at our award-winning on-site restaurants. Known as the birthplace of wine in California, and the location where California was born as one of the United States, Sonoma Valley is the premier destination for wine, food, arts, culture and lifestyle. Blending the old with the new, visitors can find 100+ world-class wineries, gourmet farm-to-table restaurants, historical landmarks, luxury spas, gorgeous places to stay and a plethora of regional and state parks for outdoor adventure. Hotel direction: 56 miles north. This hotel does not provide shuttle service. Alternate transportation: Shuttle California; fee: $90 (one way); reservation required. Airport Exit to US-101 N / I-380 W to San Francisco / San Bruno and I-280. Exit US-101 onto I-380, go West for 1.1 miles. Exit I-380 onto I-280 N to San Francisco. Continue on I-280 Junipero Serra Fwy for 6 miles. Continue on CA-1 at sign reading CA-1 to 19th Avenue / Golden Gate Bridge and go North for 7 miles. Exit CA-1 via ramp at sign reading “Golden Gate BR” onto US-101 and go North for 21 miles. Exit US-101 via ramp reading CA-37 East to Vallejo / Napa. Continue on CA-37 for approx. 7 miles. Turn left at stop light onto CA-121 / Arnold Drive at sign reading “CA-121 N to Sonoma / Napa (Infineon Raceway will be on the left) and go North for 6.6 miles. Stay straight to go onto CA-116 for 1.6 miles. Stay straight to go onto Arnold Drive for 1.4 miles. Turn right onto Leveroni Rd. and continue east for 1.8 miles. The Lodge at Sonoma will be on your left at the corner of Leveroni Rd. and CA-12 / Broadway. The main entrance is at 1325 Broadway. Hotel direction: 57 miles northwest. This hotel does not provide shuttle service. Alternate transportation: Rental car; reservation required. Exit Oakland International Airport at sign reading “I-880 N to Downtown Oakland” and continue North on I-880 / Nimitz Fwy for approx. 10 miles. Take I-80 E for 4.0 miles to I-580 W towards Point Richmond / San Rafael. Continue on I-580 for approx. 13 miles across bridge and pay toll before merging on to US-101 N.
Take US-101 N for 8.5 miles. Continue on CA-37 for approx. 7 miles. Turn left at stop light onto CA-121 / Arnold Drive at sign reading “CA-121 N to Sonoma / Napa” (Infinenon Raceway will be on the left) and go North for 7 miles. Turn left on CA-121 /Arnold Drive at sign reading “CA-121 N to Sonoma / Napa” and go North for 6.6 miles. Stay straight to go onto CA-116 for 1.6 miles. Stay straight to go onto Arnold Drive for 1.4 miles. The Lodge at Sonoma will be on your left at the corner of Broadway / CA-12 and Leveroni Rd. Hotel direction: 76 miles southwest. This hotel does not provide shuttle service. Go South on Airport Blvd. for 1.5 miles. Bear right at sign reading “I-5 N to Woodland” and go approx. 8 miles. Bear right on access road at sign reading “Main St. to Woodland and CA-113 S” and go Northwest for 0.3 miles. Turn left on E Main St. and go West for 0.4 miles. Turn left on ramp at sign reading “CA-113 to Davis” and continue South on CA-113, Vic Fazio Hwy for approx. 10 miles. Exit CA-113 via ramp to I-80. Continue West on CA-12, Jameson Canyon Rd. for 6 miles. Bear right onto CA-29 and go Northwest for 5 miles. Turn left at Hwy 12/121 (West) towards Sonoma. Turn right at stop light onto Napa Road (Nicholson Winery will be on the right) and go West for 4.2 miles. Napa Rd. becomes Leveroni Rd. at CA-12 / Broadway. The Lodge at Sonoma is on the NW corner of Broadway and Leveroni Rd at 1325 Broadway.